I love soups and stews this time of year. Actually, I love them all year long but my family looks at me funny when they come home from a 100+ degree day in August to find a big pot of chicken stew with hot cornbread on the stovetop, so I have to get my kicks in the fall and winter months in order to tide me over through the summer. Once that first bit of chill hits the air, I’m off to the races! 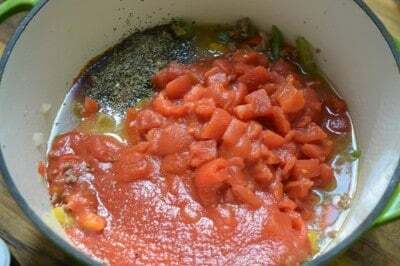 I whipped up this soup earlier in the week when I decided I wanted a soup version of Mama’s Stuffed Peppers. Basing the recipe loosely off of hers. You know though, whenever I come up with a new recipe and I like it, I worry that it is just me. Kinda like how a Mama always thinks her babies are pretty (but they are, right?). While I was making this, Katy had some friends over and little Sarah (who is 10) got a whiff of this soup and became my shadow until I was done photographing it. “Do you want a bowl?” I asked her, and she eagerly nodded that she did. I tried not to look surprised. “You know it has lots of onions and peppers in it, right?” Her eyes got big in appreciation as she polished off two bowls. Wow! I sent her home with a quart jar of it. God love him. He is the king of compliments that are really not compliments and he truly doesn’t mean to. The most common phrase he utters whenever he tries a new recipe I’ve made is: “Wow! This is actually good!”. Last time he did that was when I had to coax him into trying a dish – and he offered that up. The secret to a long marriage is realizing it isn’t meant in offense and then laughing at it rather than being offended. You gotta admit it is funny. With a few hundred thousand cookbooks sold, credits like editor titles at Southern Living and Taste of the South, and the stats on this website, I remind him from time to time that some folks actually consider me to be a good cook. Let’s make us a soup that is actually good now, shall we? 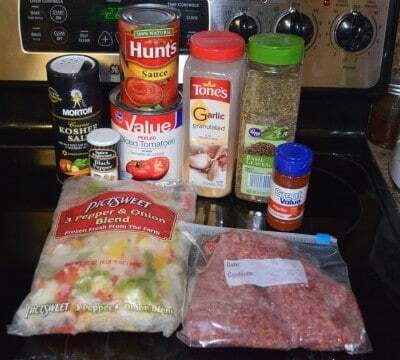 You’re gonna need: Salt, Pepper, Tomato Sauce, Diced Tomatoes, Garlic Powder, Dried Basil, Paprika, Frozen Pepper and Onion Blend*, Ground Beef, and Chili Powder**. *Frozen Pepper and Onion Blend is sold under a few different brands. It is basically a bag of pre diced assorted colored peppers and onions. Not only does this take a lot of work off of you but it saves a good bit of money over buying a few peppers fresh. I am using a bag that is 1 pound, 6 ounces but you can just use a one pound bag if that is what you find. It will be fine and still taste just as good. This really gives our soup a PUNCH of flavor. Like watching paint dry… Life is exciting enough around here without me having to do stunt food photography. Tomorrow is Friday Funday, as my friend Amy calls it, over at the arsenal near my house. That is the day that those of us in our homes are entertained all day while just about every manner of explosion takes place. Shake, rattle, and roll is the name of the game for our walls. BOOM! Booom booom boom! All. Day. Long. Every. Friday. And some surprise days in between :). If you ever have a guest over during this time it’s always fun to see the constantly growing look of concern on their face. “What was that?” gets asked fifty million times and we just wave it off. I still look outside when the military helicopters fly a little too low over my house, though. I swear they are scoping out landing spots amidst my shingles. ~sigh~ I really need a house in the mountains…. 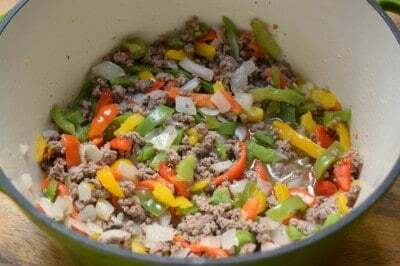 After you’ve browned your beef, add your onion and pepper blend and continue cooking until your peppers are soft and onions are a bit translucent. Or until you get tired of fooling with it, whichever comes first. Add all of your other ingredients to the pot, except for the rice. You can’t see the water in this photo because I haven’t added it yet because I wanted you to be able to see the other ingredients in there because I am such a nice person because my mother raised me to be that way. Giant run on sentence using the word “because” four times. Check! Oh hey, if you want, you can toss all of this in the slow cooker on low for the day and then add the rice when you get home. All you gotta do is brown that beef and onion/pepper stuff a little first. Bring this just to a boil and then reduce heat to simmer for about 30 minutes, or until you just can’t wait any longer. Stir in rice just before serving. Note: If you aren’t going to eat it all that day, I suggest stirring rice into each individual bowl of soup rather than the whole pot. Now eat that up! 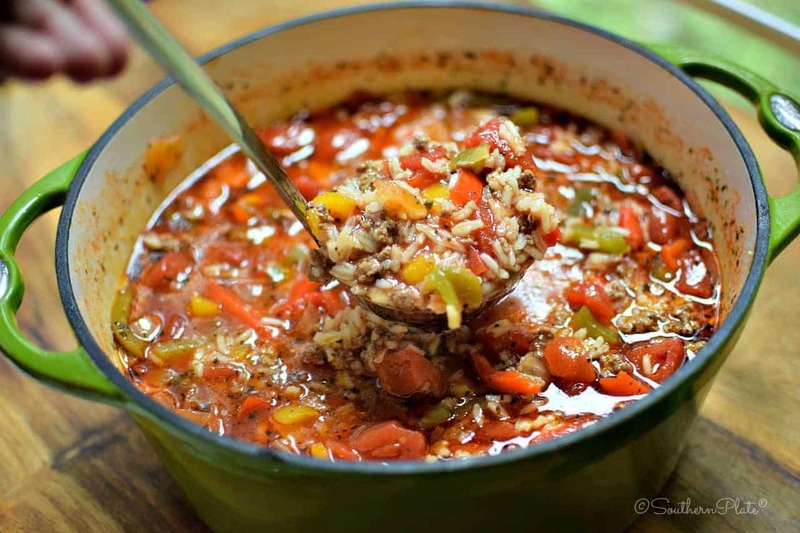 One pot comfort coming right up! 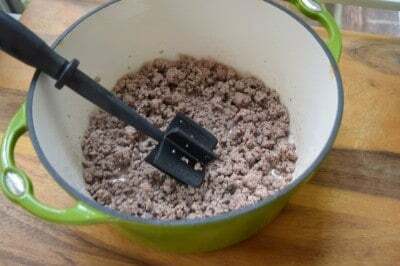 In large pot or dutch oven, brown beef over medium high heat until no longer pink. Drain, if needed. Add onion and pepper blend and continue cooking until peppers are tender and onions are slightly translucent. Stir in all other ingredients except for rice. Bring to a boil over medium heat and then reduce heat and simmer for about thirty minutes, stirring from time to time. Stir in rice to each bowl or the whole pot just before serving. About an three or four inches below this paragraph there is a big box that says “Enjoy this post? Never miss another!” and then a place where you can put in your name and email. If you don’t subscribe to my emails yet, I would really love it if you would. Often, we rely on Pinterest or Facebook to get the new recipes to you but they change how they operate so often that you can’t really count on them. Generally, about 1% of my Facebook audience is even shown my posts there. If you subscribe, though, I personally have your email address and include you into the emails I send out with new recipes and posts. No one will ever see your email address but me and you’ll generally get 2-4 emails a week. I’d sure love to have a reliable way to keep you updated on the latest Southern Plate posts! I have a stuffed pepper soup in the crock pot today that I got off of another website. Looking forward to trying yours next as it is just a bit different. Great tip about the rice though. I had not thought to just do the individual bowls. Makes sense so it is not mush. Thanks!!! What a great and flavorful recipe! I love stuffed pepper soup but my husband will not touch rice with a 10 foot pole, I have started using the little pasta that looks like rice. Satisfies us both. This sounds great! I can’t wait to make it. I eat soup whether it’s hot or cold outside. I just love soup and especially the fact that soup is so great on the budget. You can make a lot for fairly low cost. Thanks Christy, i appreciate you so much. You are a true blessing to so many, in many ways! So….if I want to use fresh veggies, one large onion and one large pepper? This soup sounds fantastic, and I can use the last of my garden peppers in it. Yay! That’ll work! I would use one and a half to two peppers but one will work just fine, too! I have another recipe for this soup but am removing it from my files because this is now the one I will use. I do think I will add some cabbage to it though. Thanks for the recipe and for your humor. My mother in law made the best stuffed peppers. I now have all her recipes since she passed. My husband and I were talking about making them soon on our trip back from Alabama this week. I love soup and this recipe sounds super good. Can’t wait to try this one soon. Just want to say again it was an absolute pleasure to meet you and your encouragement was exactly what I needed. Would you share your MIL’s recipe for stuffed peppers? Thank you. If you love stuffed green peppers, then you MUST try Christy’s Cornbread-Stuffed Green Pepper Rings. I don’t even make peppers the traditional way anymore, since my husband looooves these so much. I ALWAYS have a bag of the frozen pepper onion blend in my freezer ! It’s such a timesaver! I have a pile of peppers my husband brought in from the garden so I may cook this later today. Tip about adding rice to each bowl is also good for those of us who are cutting back the carbs for health reasons. Otherwise the recipe is perfect for us! Looks just yummy, I get frustrated a bit, you have things in your stores I never see, hominy being one, 30 years ago I used to be able to get this way up here in Canada, but no more. You get Rotel, and we used to get zucchini, onions and tomatoes, no more. You get lovely things like mixed peppers and onions in frozen bags, we can’t even find peppers in bags let alone onions. So cooking one of your recipes is a process of substitution, fresh stuff for what we can’t find, add things to aproximate something you can get likebthe rotel or frozen pepper mix, but it comes out tsdting great. I have 3 grocery stores in town, not little ones either, used to have 5, so we get whatever head office in Toronto thinks sells here and like it. Hey Eva! First of all, I can only imagine your frustration and I’m so sorry for it! This really interests me – why do you think it is that you can no longer get things that you used to be able to get? Do you think it is demand or perhaps too costly to transport to where you are? You know, it is amazing how many different fruits and vegetables are in our grocery stores that folks growing up in the south had never even heard of until the past decade or so. It’s always interesting to me how different regions have different availability. I use that green pepper and onion frozen thing in everything- spaghetti,meatloaf,stuffing,its just so handy.I find it at my local Public as “pepper stir fry”.It’s the best thing ever. I just love stuffed peppers and this sounds just awesome.I’ll probably put mine over yellow rice.Mmmmm!And cornbread too! Don’t got a guy around currently but I do remember “backhanded compliments”lol.My ex fiancee was a jokester who tried me on those quite a bit.Manicotti usually hushed him up tho.hehheh. Have a great day Ms.Christy! Oh my goodness – I cannot wait to try this. I love soup/stews all year round too. An interesting new twist on stuffed peppers. I have made what I call a deconstructed stuffed pepper casserole. Quite similar, but obviously less like a soup. I’ll look forward to trying out your version. This soup sounds great, and I will second the poster who said to try Christy’s Cornbread-Stuffed Pepper Rings! They are soooooooo good!! Hi Christy! I made this a couple of weeks ago and substituted quinoa for the rice!! It is loaded with protein and so good for us! Just a suggestion! PS Yummy cold weather, or any weather, soup!! Can this be frozen, without the rice? Thanks! No you can’t freeze it. You must make a hog of yourself and eat every last bit. I was really prepared not to like this recipe – just not a fan of stuffed green peppers – but I enjoy your humor so much and, well, your hubby’s “This is actually good!” we will give it a try! Thank you always Christy! Never had this, but I do like stuffed peppers so sure I will like this too….looking forward to making it when I have company…..thanks a bunch for all your recipes Christy…..keep them coming…. I also need to check out your green pepper cornbread rings !!!! have no idea just what that is tho…. Your comments about your husband’s back-handed compliment tickled me. I remember when my hubby and I first got married and I would cook for his Grandmother and she would tell me that what I cooked was “pretty good.” It took me several years to realize that was as high a praise as she knew how to give. After I finally figured that out, it made cooking for her more pleasurable. I never have to worry about my Hubby letting me know if he likes something I cook – when he asks for seconds and for me to save leftovers, I know what I made was a hit. Of course, after 46 years of cooking for him, I certainly know what his favorites are. Your soup sounds so good. Reminds me of my Moms Italian stuffed peppers with red wine. Hum might add a little to mine. I like rice sometimes but not a big fan. I might try it with pearl barley. It doesn’t get mushy like rice & has a nice texture to it. I was raised on good southern food (even though born in Kansas, moved to California when 4 & raised in Northern California Mountains close to Yosemite) but family tree is southern. Ha, ha!! What a mix for this 61 year old cowgirl!!! 🙂 Who won’t eat bread dressing, only cast iron cornbread dressing. Thank you for all your good recipes & inspiration. Christy — Which arsenal do you leave near? When I was a college student (during the Vietnam War), I worked summers at Ft Detrick and Edgewood Arsenal. Now Frederick was a nice quiet town to live in (although some of the locals weren’t too fond of us), but Edgewood was a whole different matter. It was right next to Aberdeen Proving Grounds. Boom, boom, boom. 105’s, 155;s mostly. I was a little too close to a boom one afternoon and my ears are still ringing over 40 years later! No brain, no pain. Love this recipe. We’ll cook some up (with cornbread — buttermilk, no sugar doggone it) tomorrow night. I keep frozen peppers and onions in the frig, as I’m too lazy to spend time cutting and peeling. Delaware is still trying to decide between summer and winter. I hope you enjoy the soup!!! I live in Huntsville, and we are wavering between summer and winter here as well on some days. This soup looks delicious, and easy with the frozen pepper/onion mix! I am all about easy recipes that taste great, and that is always what I get with your recipes, Christy. I am so glad I found you! I know my husband likes a dish if he says it was good and especially if he gets seconds and says to save the leftovers (or eats it all so there are no leftovers). If he just thanks me for the meal, I know that it was tolerable and he appreciates the work that went into it, but didn’t really enjoy it. If he doesn’t say anything at all, well…that speaks for itself. I am blessed that he never criticizes my cooking, no matter how bad something may turn out. He recognizes that if I put in the effort to make it, he should eat it and be glad for it. I hope you like it Cynthia! What a great guy!! Sounds like his Mama raised him right!! I will try this when the weather is a little cooler, but the first thing I am going to make is a pot of your family’s Chicken Stew! For those of you who have never made this , try it and I promise you will love it! Even my husband likes this with hot cornbread. He normanally doesn’t like soups, except clam chowder, New England Clam Chowder. I love soups and stews. Ready for pretty fall days and cool evenings. I am so glad y’all like the chicken stew!! It is one of my favorites as well! Your husband sounds just like mine. Mine will swear that he will not eat this soup, but will and say, “this is actually good”! Sound familiar? The end of this month I am headed to that cabin in the mountains!!!! Praying for early snow – there and if not snow – lots of beautiful fall colors on all those trees! LOL, wonder if they are brothers Jan.
We too have an arsenal close. We hear it only around 10 PM. I try to remember they are going to keep us safe! Love your recipes and books.